Most babies cut their first teeth at about six months; only 1 percent cut their first tooth before 4 months. Parents and pediatricians alike often attribute mild transient symptoms such as irritability to teething, even if teeth don't appear for months afterwards. Many babies do have mild symptoms when teething, but parents should rule out other illnesses before blaming potentially serious symptoms such as diarrhea on teething. Teething infants may be more fussy and irritable than usual because of discomfort in the gum above the about-to-erupt tooth. Irritability often begins around four days before the tooth erupts and continue approximately three days after the emergence of the tooth. If your baby is irritable and you can feel the tooth under the gum, if the area looks bumpy, or if the tip of the tooth appears, teething might be causing his irritability. Ask your pediatrician before giving a three-month-old acetaminophen or ibuprofen to relieve his discomfort. Teething does not cause inconsolable crying. If your baby is extremely irritable, call the pediatrician. When your baby's tooth is about to emerge, he may produce more drool than usual. Although drooling is a normal part of an infant's development, it sometimes increases with the teething phase. Excessive drool may cause a baby to develop a rash on his chest, neck and chin. Applying a thin layer of petroleum jelly to the susceptible areas helps prevent rashes from developing. 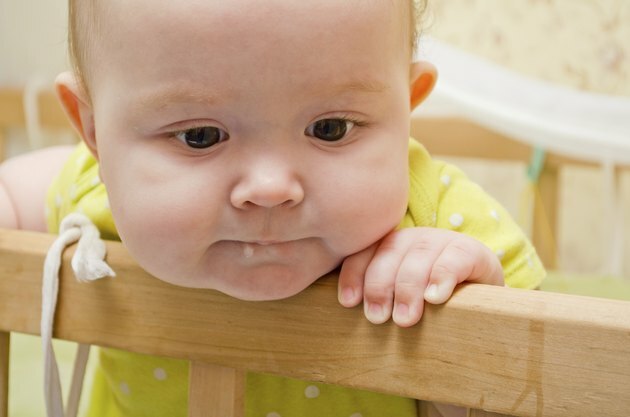 Some babies also develop reddened cheeks, unrelated to drooling, while teething. As teeth begin to push up through your baby's gums, you may notice swelling, redness and possibly even bruising on the gums. To relieve the discomfort, try massaging over her gums with a clean finger or a cool, damp washcloth; the pressure will temporarily ease the pain. 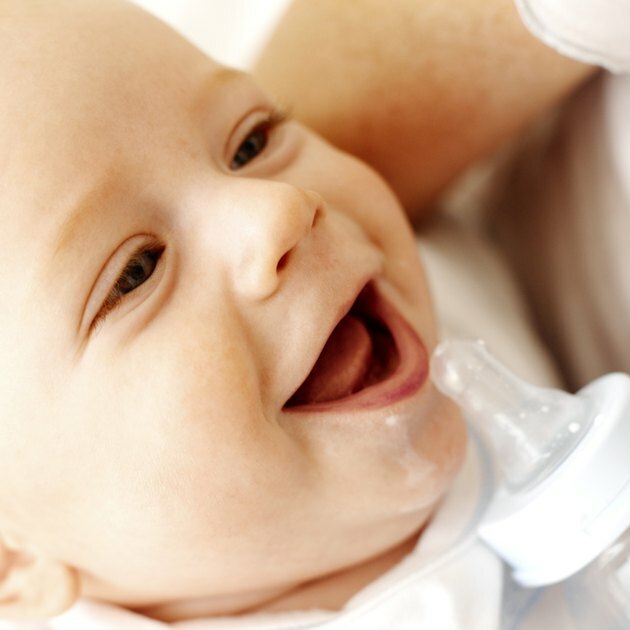 Teething gels applied directly to the gums can also help relieve pain, but read labels carefully and ask your pediatrician first if the product suggests not using the gel on a 3-month-old infant. Overuse of gels containing topical 2 percent lidocaine can cause seizures, the pediatric textbook, "The 5-Minute Pediatric Consult" warns. Although a significant increase in body temperature likely has little to do with teething, a teething baby's swollen gums may provoke a mild fever. 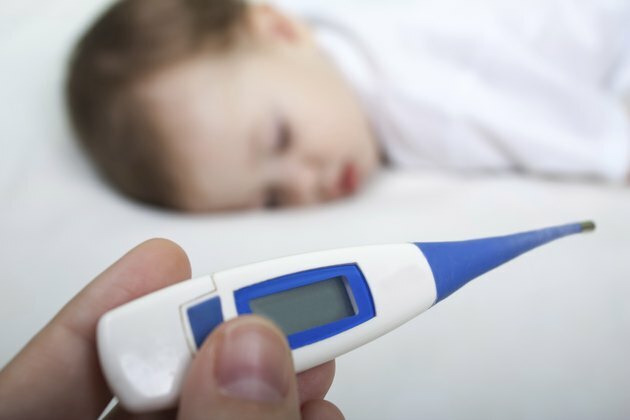 Fever greater than 100.6 F is not associated with teething. Any fever in a 3-month-old requires medical investigation, even if he's teething. Talk to your baby's pediatrician to rule out more serious causes of fever. Parents often attribute a bout of diarrhea to teething. Teething may cause loose stools but generally does not cause diarrhea. A parent's perception that diarrhea caused by teething is benign, however, could have harmful consequences, a "Western Journal of Medicine" article published in 2000 cautions. Dehydration can occur from diarrhea, no matter what the cause, particularly in an infant as young as 3 months. Call your pediatrician promptly any time your baby develops diarrhea, whether he's teething or not. Western Journal of Medicine: Is Teething Associated with Diarrhea?